News from WTM Africa 2017: City Sightseeing now links the Cape Town Big 7! 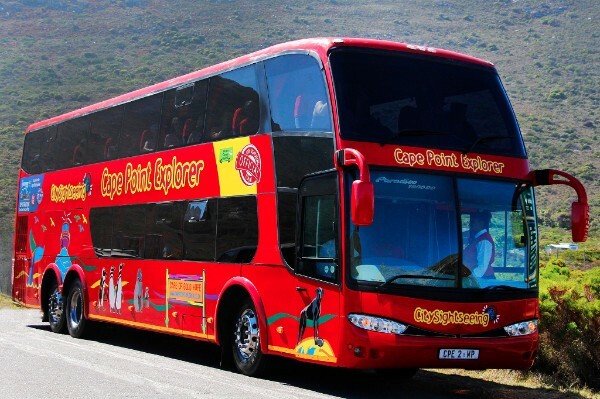 Cape Town, April 2017 – City Sightseeing, the operators of the iconic red buses in Cape Town and Johannesburg have recently added the Cape Point Explorer to their offering. In operation since 1 February 2017, the new Cape Point Explorer is a guided tour that takes visitors to the Cape Point reserve via some of Cape Town’s most spectacular areas of natural beauty. 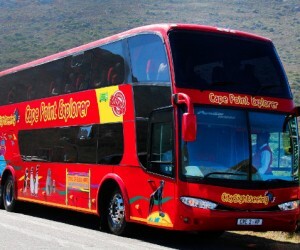 “As Cape Point Partnership we are delighted that City Sightseeing now comes to Cape Point. They have identified a gap in the market between the self-drive visitors and the visitors who prefer a tour group. Their success on the route thus far shows the demand for more opportunities in tourism spread towards the southern side of Cape Town. With City Sightseeing’s red buses now connecting all of the Cape Town Big 7 attractions, Cape Town visitors have a convenient and affordable way to access the ‘bucket list’ places to see in the Mother City.” says Brett Hendricks, General Manager, Thebe Tourism Group. This new route has not only added an important destination to the existing stops but now allows City Sightseeing to conveniently and affordably provide a link to all the Cape Town Big 7 attractions. The Cape Town Big 7 represents the perfect combination of dramatic scenic beauty, enthralling history and exhilarating activities that have come to define this beautiful corner of South Africa. Cape Point, City Walk, Groot Constantia, Kirstenbosch, Robben Island Museum, Table Mountain Cableway and V&A Waterfront are the iconic destinations that form the core of the true Cape Town experience. Interested in hopping on with City Sightseeing and seeing the Cape Town Big 7? Stop 1 and home to a red bus tour office (just outside the Two Oceans Aquarium), the V&A Waterfront is a hive of activity, especially during the summer months. Grab a bite to eat while looking out at the harbour, enjoy a free performance at the amphitheatre, go shopping at one of the 450 stores or treat the kids to a Cape Wheel ride. With regard to Robben Island, we don't go there directly, we're a bus service! That said, the Clock Tower is stop 2 and this is where you'll hop off for the Nelson Mandela Gateway to Robben Island. Here, you book your tickets and take a short ferry ride to the World Heritage Site. Stop 7, the Table Mountain Cableway, allows visitors to enjoy a spectacular 360-degree view as they go up and down in the cable car, and explore the mountaintop with a free guided tour. At Stop 20 you’ll find the Kirstenbosch National Botanical Garden. Walk among South Africa's indigenous plants, take in the scents of the diverse fynbos flora, spot our national flower – the protea – and explore the themed gardens. The Centenary Tree Canopy Walkway (informally known as the "Boomslang") has become a popular feature in the garden – the bridge takes visitors through and over trees, touching the forest floor twice. At stop 25, visitors can sip on famous wine at South Africa's oldest wine farm, Groot Constantia. Rich in history, visitors to the estate are in for a treat with its wondrous views of the valley and vineyards. The City Walk is a great way to see the city on foot. It's a chance to marvel at the old architecture, engage with the public spaces and art, learn about the history of the CBD and gain some insight into the present. Last but not least, the Cape Point Explorer allows visitors to experience Cape Point, a World Heritage Site, in all its glory. The tour is a full-day, guided excursion (in English) in a luxury air-conditioned coach. The Cape Point Explorer is not a hop-on, hop-off tour, but a full day’s excursion, featuring a drive through picturesque Muizenberg, Fish Hoek and, time permitting, a stop in the naval town of Simons Town, followed by a visit to Boulders Beach with its fascinating, famous colony of African penguins. The tour then continues to Cape Point, with time for an optional lunch and hike to the Cape of Good Hope. See the best of Cape Town with City Sightseeing and the Cape Town Big 7. Hop on!